FINISH: We’ve worked with Andy on a few custom projects in the past as you may know. 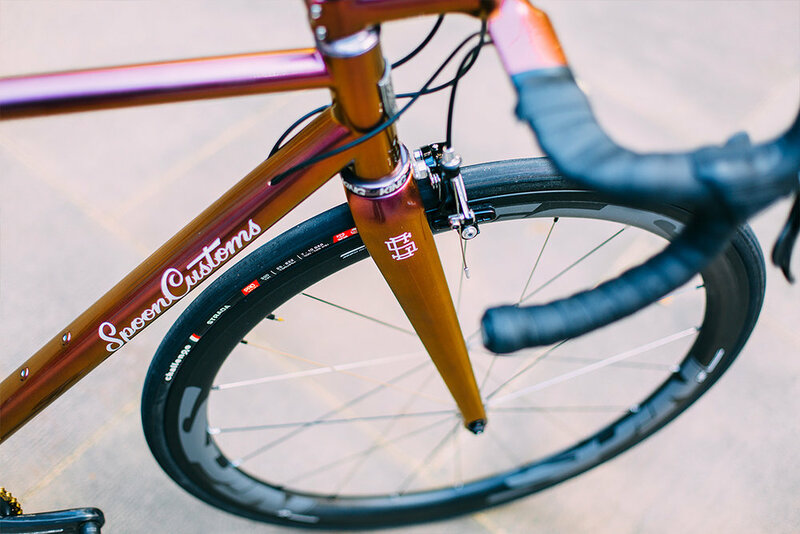 This frameset marks the first Spoon Customs production frame. With that in mind Andy came to us looking for something that had ‘wow’ factor, was straightforward to reproduce on future framesets but would still sit well within the clean, considered aesthetic he has already established for his brand. Together we came up with this finish. It’s an all-over colour-shifting “flip” paint usually reserved for high-end sports cars. The colour moves from golds , through peaches and magentas and lands on a rich cherry, all the while retaining an almost liquid quality under the SPI gloss. The minimal graphics are applied in an “Old English White” and stand in stark contrast to the quiet/loud dynamics of the base colour. Finally we colour matched the specially selected 3T cockpit to bring the whole thing together.